Contact us today to make your reservation or arrange your special event. The Weir welcome’s man’s best friend. Water bowls are available on request, and well behaved dogs receive treats from our special jar. Please ensure your dog is kept on a leash at all times. Dogs are not allowed in the main dining room and should be seen but not heard please. The management reserves the right to refuse naughty dogs. Feel free to call us on 020 8568 3600, email us directly or use this quick form and we’ll get back to you! For group dining reservations of fifteen people or more, a credit card will be required to secure your booking. Payment will not be taken at that time but, in the event of a cancellation less than 48 hours before the event, there will be a cover charge of £10 per person. 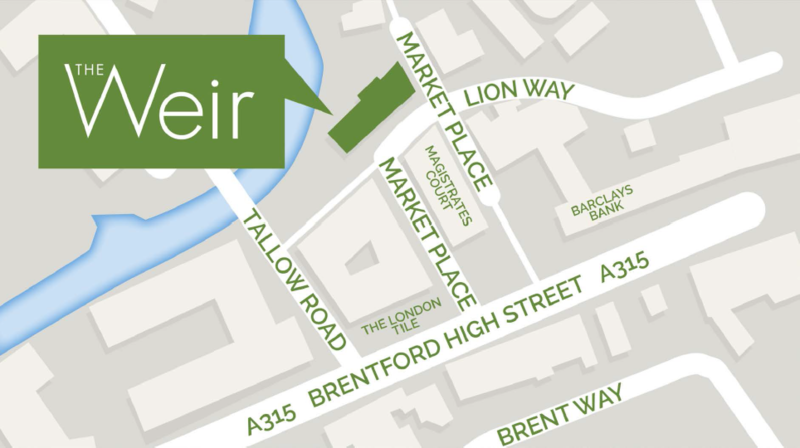 The Weir is just off Brentford High Street. Turn into Market Place. Follow the road to the right and you will find The Weir on your left. To find us on Google maps, click here.